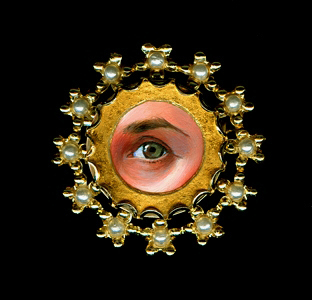 Some of the smallest miniature paintings ever made are eye portraits in miniature. The tradition of eye portraits is from long ago, and it is a very romantic tradition, so the original antique eye portraiture was, and still is, referred to as "lover's eyes". These portraits preserved in some instances the subject of the painting's identity in a very discreet way, and yet husbands and wives could also have lover's eyes done for one another as a special gift, even unto today. 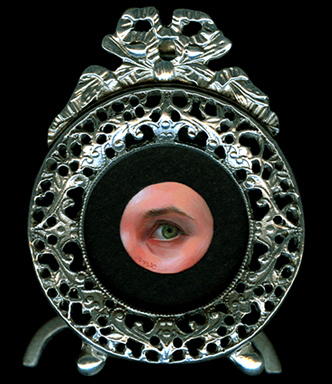 For the fun, but also for preserving what it may mean to people, I decided a number of years ago that I would try to revive this gentle tradition with a few examples of my own traditional lover's eye portraits, one of which has already sold as a jewelry item keepsake piece. The first eye portrait on this page, however, has a spiritual tone to it and it's called "Amma's Eyes" showing the eyes in meditation of my guru, Amritanandamayi Ma. 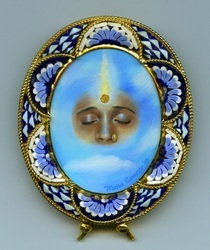 She is also known to Americans as Ammachi, or Amma ("Mother") and is often referred to as the "hugging saint".